Spectacular event of magnetic proportions awaits mankind’s entrance through the gateway of creation once more. Thorough the gateway of creation of the flower of life and the eternal essence of being. The structural component grids of the aforementioned genesis of creation has been recalibrated with the new frequency of being and new set of accords has been instituted into the physical institutions and representations of that which humanity believes to be. For through the representation of the highest octave of being, you shall begin to see candid facts of eternal angelic guidance and the flower of life and the eternal flame of the violet, manifest into your daily activities through the truth of that which shall be bestowed upon you by those who hold the books of the ancients, for the books of the ancients carry the informational decree of eons past. The profitable encounters with those of the past, have led the ones who are in charge to dispense such information for all to see. Uncovered and realized through the veil of misinformation, the ones that shall lay their eyes upon such personalized decrees shall become masters of the ages. Masters of the ages of the eons past and eons yet to come. For the structural grids, and components and encodings of the alphabetical structure of the ancients, shall spur he newly formed understanding of reality, and the physical proof that many are eagerly awaiting. For the ones in command of the religions texts of your known world have indeed been called upon to make necessary adjustments based on the newly found principles of being. For once more we you shall bear witness to the rising of a newly constructed idealisms, ideas and representation of the heavenly abodes. For once more a new spiritual infrastructure shall arise, breaking apart that which all have been led to believe. And when such moment occurs, the ones that have indeed past the ring past not, shall be there to gather the pieces of the fallen ones. The pieces of the fallen ones, for the fallen ones shall spin in a centrifuge of their being, rebirthing and giving rise to a new energy source. The new energy source of light and love, appreciation and warmth, beauty and serenity, peace and harmony, abundance and health, abundance and understanding of the eternal influence of the eternal OM. And so, as has been preordained, as has been established and as you have indeed been informed of what’s to come, we once again reiterate the importance of liberating yourselves form the past of your ego structures. For once again the phase into which you all have entered shall take leaps and bounds brining the fruitful outcome for all involved. For through the upheavals and downfalls shall a new world, a new structure be fully integrated into ones being. And thus, you are once again to stay strong in your convictions, to stay true to you chosen path, to stay true to that which you have come here to accomplish and that which you have come here to be. For the flower of life, and eternal flame of the violet shall play a very important role in the days to come. The eternal flame of the violet and the flower of life shall merge and intertwine into your being, clearing the pathway for new conscious grids, clearing a pathway to a newfound freedom and bridging you the core of your being, and allowing new portals and new octaves of light to operate in your vehicles and the world in which you dwell. New octave and a new set of accords of which we speak, shall be revealed to you step by step in due time. For now we ask that you attune yourselves to the new frequency flowing freely within your world. Flowing freely and embracing each one of you in unconditional co creation of being. That is al that we have for you now. We love you. We are with you. Goodbye for now. Personal note: Last few days I have been receiving various visions of change. The change that has been ongoing for months is about to step onto a new level. As you understand we are moving through a corridor of changes, and as one layer falls away another one opens. What I was shown is that the leaders of various religions have been visited by our galactic families, and have been shown artifacts of the past, and were told the truth about humanity’s existence. What I was shown is that various religious leaders will begin communicating this to the world more and more. Please note that this will not happen overnight, it cannot. This is a gradual process. However, to assist them in doing so, there are many artifacts that will emerge in archaeological excavations. People at random doing construction of their houses will dig up various ancient pieces of various incredibly advanced civilizations which will serve as direct proof of our planet being visited by “aliens” in the past. Moreover, these discoveries will point to already existing technology of our world, and technology that many of our scientists and engineers are working to bring forward. The missing pieces of information that they are lacking will be uncovered by archaeologist, which will astonish them and bring both the scientific and religious communities closer together. As an undeniable link will begin to form with direct proof that ancient humans have not only been visited, but seeded on this planet by various “alien” races. All of this information will of course confuse many, and naturally our media will try to keep this information under wraps. However, this information will still be posted online for all to see, and many will still be drawn to this information and will begin to awaken, just like all of us have awakened. In doing so, the energy of the planet will begin changing. First to chaos, as per usual, and then it will slowly stabilize. That is why so many times recently we are hearing in various channelings that we must stay stable and assist those who are awakening. Because we are going to be needed greatly. All of this has already began but will truly take effect starting tomorrow, after the blood moon, as the blood moon itself will cleanse so many out, and truly align the light workers with their missions. 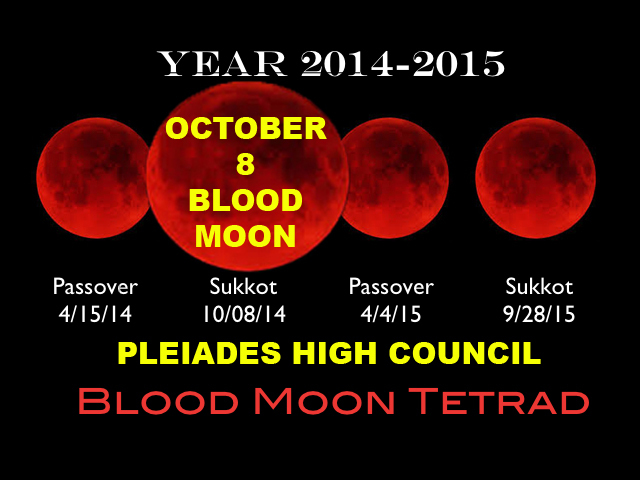 The month following the blood moon will see us raising in our powers and frequencies. We will see how rapidly everything will change in our lives. All this will continue to rise until the end of this year, as we are being prepared for 2015. As 2015 is an incredibly significant year, where our strength, light and love will be tested many times over. 2015 promises to be a year of tremendous changes, as we anchor this world into a new dimension. All these changes begin now, and gradually will morph into various outcomes. So please gather all your patience as you will be needing much of it. Remember to ground yourselves as much as possible. Use the power of the violet flame, as you can see it will become prevalent in our world. We will be seeing lots of it. Thank you for listening. I love you all incredibly much and am grateful to walk along this path with all of you. Ana just confirmed what i told you about discovery’s in diffrent coutryes . This is far away as you can imaging from my Igo. To me it means that we are doing our divine work that we came here to do. I think i told you about two weeks a go. It is moving fast now,after today truly the domino effect will take place. Opening that huge portal was so important today ,this is also confermation on that as well it 2 am i just got this on my e mail. My Love and Eternal Gratitude to you dear Anna to bring the word from Councils to us. Thank You, thank you, thank you. Ahhhhhhhhhhhh!!!!! Yes!!!!!!!! I do so resonate with this toooooooooo!!!!!! Thankyou soooooooooooooooooo much for this wonders of information~WoW!!!!!!!!!!!! AnnA!!!!!!!!!!!!!!!!! It is getting more exciting our journey, thank you for being with us. Greetings Jerri, I use paypal to process credit card payments, so if you click on PayPal button you will be taken to another page where you can select to pay by credit card ❤ 🙂 Thank you for your support! Our planet is a bit like spacecenter babylon 5, a a place where many star races have meet and greet to earlier humanity. It’s time to reestablish this visits, for our benefit and uplift.